Do you experience an aching, tired back at the end of the day at your nail salon? Pure Spa Direct has the answer - the European Touch ErgoPro Technician Chair! This will be the last chair you ever need...and it is versatile enough to use when performing manicures OR pedicures! The European Touch ErgoPro is the most advanced ergonomic chair available. 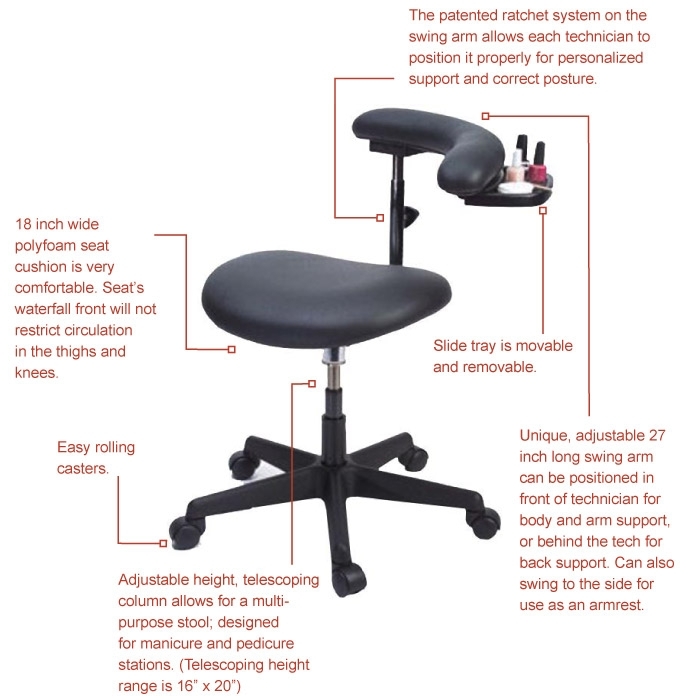 It offers a balanced sitting position and proper upper body and lumbar support to help you face each day comfortably. Contoured seat promotes proper upper body posture and reduces back strain. 18 inch wide polyfoam seat cushion is very comfortable and provides correct weight distribution. The seat's waterfall front will not restrict circulation in the thighs and knees. Back of seat is lower than the front to allow for correct pelvic tilt. This tilt puts your hips at a comfortable 90 degree angle to decrease fatigue. Unique 27 inch long swing arm can be positioned in front of technician for body and arm support or behind the tech for back support. Movable and removable tray keeps implements and other items within your reach. If the ErgoPro is not the chair for you, check out Pure Spa Direct's wide selection of ergonomic stools! Everyone deserves to be comfortable!